Updated Apple's iPad won't be available in the company's brick-and-mortar stores until this Saturday, but on Monday Cupertino added a series of videos to its website that provide more detail on the device's "magical and revolutionary" capabilities - and The Reg sat through each self-congratulatory video to give you a deep-dive preview. The 11 Guided Tours provide far more solid details than do Apple's previous video offerings: a TV advert and an eight-minute homage featuring designer Jony Ive, marketeer Phil Schiller, software chief Scott Forstall, and hardware honcho Bob Mansfield. Even though the first batch of iPads is already sold out, Apple's videos are intended to stoke the fanboi frenzy by providing demos and details of its Safari browser; mail, photo, and video apps; YouTube access; and iPod and iTunes store capabilities. The Tours also detail four apps that don't mimic iPhone and iPod touch capabilities, namely its iBooks ebook reader and online iBookstore, plus the Keynote presentation app, Pages word processor and minimalist page-layout app, and Numbers spreadsheet app for undemanding number crunchers. Except for those last three, all apps are free and ship with the iPad. Apple says that Keynote, Pages and Numbers were all rewritten "from the ground up" for the iPad, and for that bit of extra effort, they're charging $9.99 each. The three productivity apps - also found in Apple's iWork suite for the Mac - are the most interesting of those demoed in the Guided Tours. Keynote, for example, takes the presentation capabilities of its Mac counterpart and translates them to a multi-touch interface. To change the position of a slide in a presentation sequence, for example, you tap and hold on it, then move it to its new position. A group of slides can be moved together by tapping and holding on one, sliding it out of the sequence, then using your other hand to tap other slides, which zip under the first slide - you then drag the collection to a new spot in the sequence. 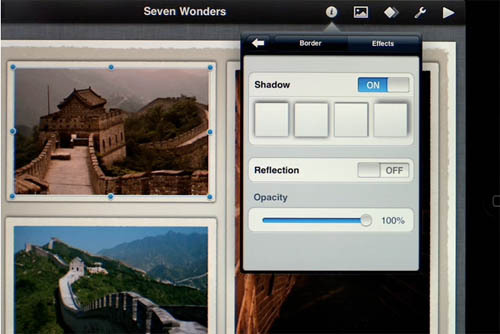 Keynote, as might be guessed, has access to images stored in the iPad's Photo app. A variety of transformations can be made to a photo: resizing; adding a variety of borders and shadows; changing zoom, rotation, and opacity; and other edits. Existing Keynote presentations can be uploaded to the iPad from your Mac, and PowerPoint presentations can be uploaded from Macs or Windows PCs. Presentations can be created on the iPad from scratch or based on 16 included templates, and a set of new transitions and animation effects can be added to slide sequences or elements. Presentations can be displayed either on the iPad itself or on a projector or TV using an optional $29 VGA adapter.